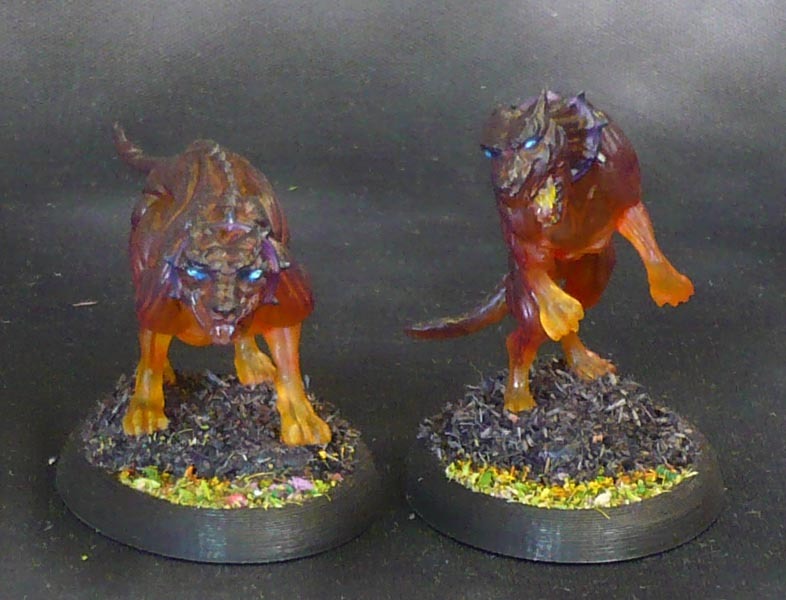 WizKids make both Nolur’s Marvelous and Pathfinder Deep Cuts miniatures, both similar in style, scale and the primer. These, however, were clear transparent with just their integral bases primed light grey. 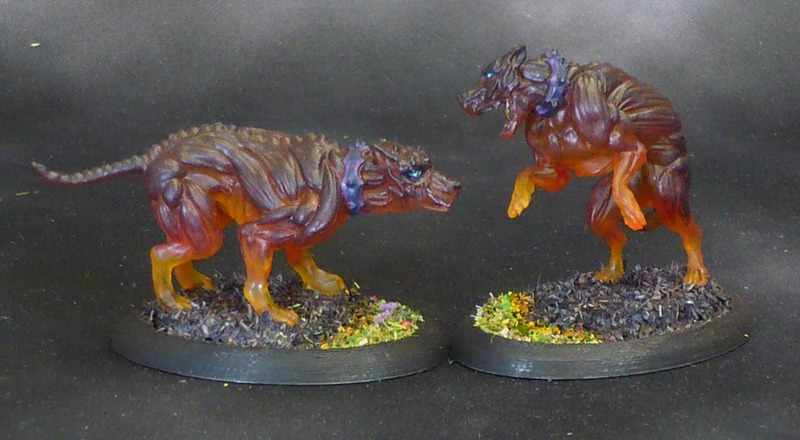 I started by painting them all over with Army painter Anti-Shine Matte varnish. Then I gave them a wash of Citadel Casandora Yellow shade. When dry I then drybrushed carefully, using only “twelve to six”-strokes (think of a clock, the strokes going straight downward) with a pinkish red, a dark reddish brown and black. As these paints were both thin and carefully applied, the effect is much like a tasty gummy bear. Some dark blue in the eye cavities, followed by Army Painter Crystal Blue and Reaper Copper Verdigris on the eyeballs to make that demonic glow. 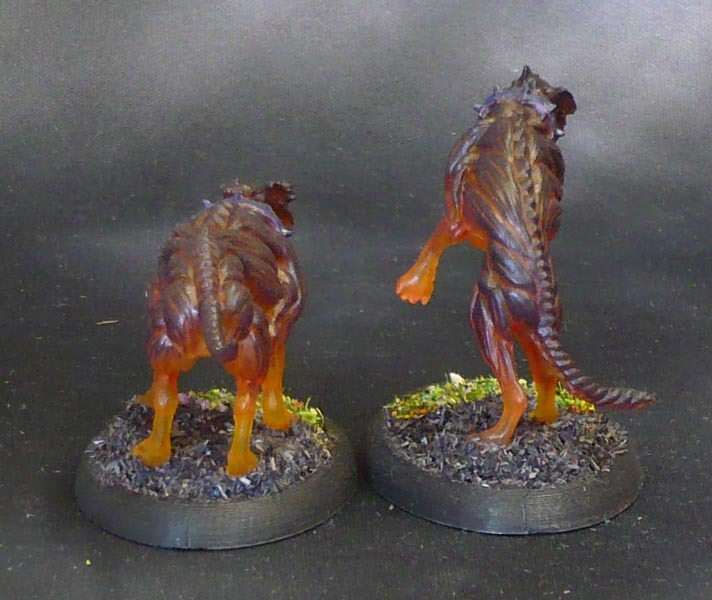 The collars were painted with scale color Black Metal, followed by Army Painter Alien Purple and Scalecolor Deep Blue, topped with some more Black Metal. Inside the open mouth I painted some Citadel Yriel Yellow and Reaper Pure White. Hell Hounds are really big dogs! 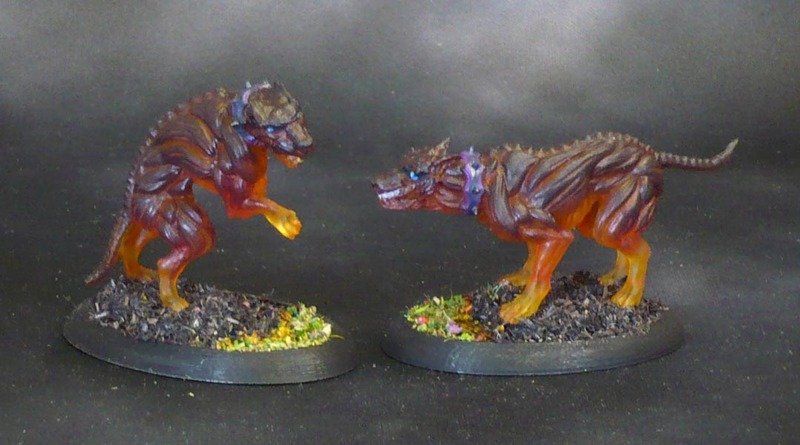 I did the bases with black flock directly beneath the hounds, with a crescent of my normal green flockmix to the front. I dabbed some yellow and orange paint along the edges to hint at burning grass. The bases themselves are 3D-printed 30mm x 45mm lipped ovals. A very interesting paint scheme, the look great!